In August, we posted an article that briefly covered each of the three types of casters most often used by Spanco. Today, we’re taking a closer look at one of those types: the Nylacron caster by Acorn Industrial Products. Although any Spanco gantry can use them, Nylacron casters are typically used as a cost-effective alternative to motorization. 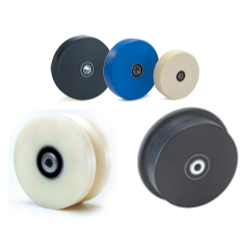 While there are certainly benefits to polyurethane and pneumatic casters as well, the Nylacron caster offers its own unique advantages, especially if you’re a business that’s operating on a modest budget. This article discusses some of those unique features. Nylacron’s biggest advantage is its capacity to carry heavy loads while remaining exceptionally easy to move. How easy? To get Nylacron wheels moving, you need a force less than one percent of the system’s rated capacity. Keeping those wheels turning takes even less: a force equal to less than one-half percent. That means far less force is required to push or pull the system, so one or two workers can easily move the system instead of having to rely on multiple nearby workers to help. The Nylacron material is a highly compressed cast polyamide. When polyamides are not being shaped into wheels for rolling industrial equipment, they can be found in wool, carpets, textiles, nylons, and other soft materials. This relative elasticity gives Nylacron products shock dampening and vibration reduction properties, both of which significantly reduce the noise associated with pushing heavy loads. It also gives the wheel much higher resilience to return to its original shape without deformation when bent by heavy or rapidly applied loads. Surprised that wheels made out of material used in jerseys and carpet can support industrial loads? Don’t be. Acorn’s casting process turns their raw materials into polyamides that boast strength equivalent to steel at one-third the weight. Finally, Nylacron’s sealed precision bearings and relatively small design minimize the daily wear and tear experienced by other types of wheels. Nylacron is durable. Even after extended use, it resists damage from water and many hazardous chemicals, and it remains functional in temperatures from -30° to 220° F. The bottom line is that you will have far less maintenance to perform on Nylacron casters. As an added bonus, you’ll have less maintenance to perform on the floors of your facility too because Nylacron will not damage most flooring types. There you have it: the four biggest reasons Spanco uses Nylacron casters as part of our product offerings. If you believe your operation would benefit from a Spanco product using Nylacron casters, locate one of our reps in your area and let them know you’re interested.